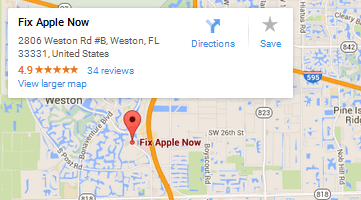 Below you can find driving directions from Google Maps to help you get from Marco Island to your nearest Fix Apple Now store, situated in Weston. You can either copy the driving instructions below or click here for a larger map and driving directions. Don't despair if you've encountered a problem with your Apple device. At Fix Apple Now, we can solve problems with the iPad, iPhone 4, 5 or 6, iPod, Apple Mac, iMac, MacBook Air and MacBook Pro for less. Our engineers are amongst the best and most experienced that the industry has to offer, and we always aim to fix your machine quickly so you can be reunited with it in no time at all. You can rely on us to return your device to full working order without making any compromises on quality, so why not contact us today? We are here to fix your iPhone in Marco Island. At Fix Apple Now, we have experience in dealing with a huge range of issues related to Apple devices. These include machines not turning on or off, cracked screens, frozen screens, enlarged icons, landscape keyboard issues, bent iPhone 6 Plus handsets and much, much more. Talk to us today if you need to fix your Apple device in Marco Island for less.